Zoya Miranda is from the just released Pixie Dust spring collection. I adore this polish. I adore the entire Pixie Dust collections. They're both gorgeous. This applied good and dried pretty quickly. I think within 15 minutes it was surface dry and by 30 minutes it was good to go. I'm wearing it right now so I can say about the wear time, but if it's like the other collection it's going to be good. 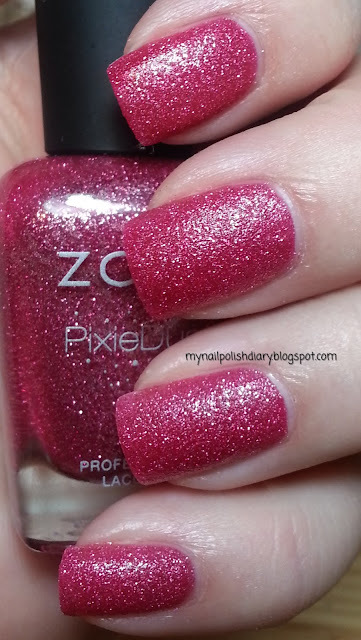 The silvery pink glitter is just to die for. And to top it off it's matte! I die!! It isn't quite as dark as my pictures make it look. I can't stop looking at my nails. And I love the feel. I keep touching. It's fun. Love, love, love this trend. Never go away!